We are on summer countdown (8 more school days – woot! 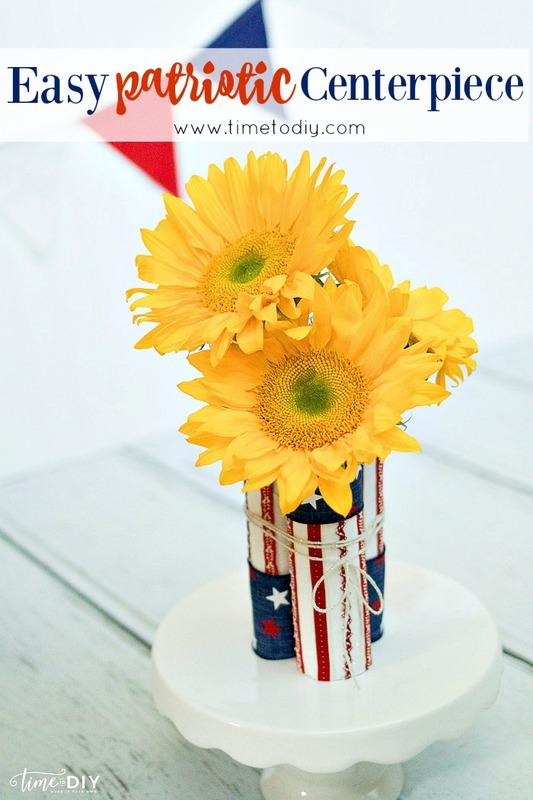 ), and I’m getting excited about summer gatherings and wanted to show you an easy patriotic centerpiece that’s perfect for a Memorial Day or Fourth of July barbecue. 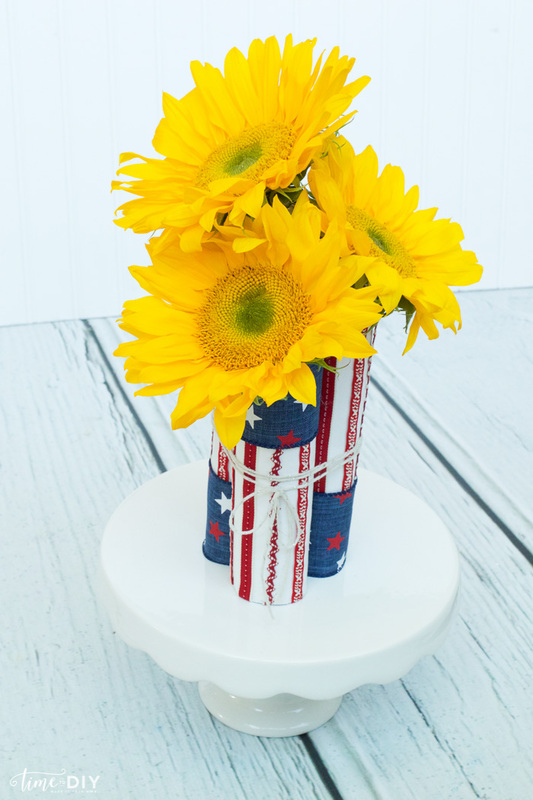 The base is even upcycled with something you already have around the house! But before I jump in, wanted to share about something new I’m starting on the blog: You may have noticed “Simple Seasonal Saturdays” in the title…because I love all things seasonal, I’m going to start regularly posting about seasonal topics! I chose Saturday because 1. I love alliteration and 2. 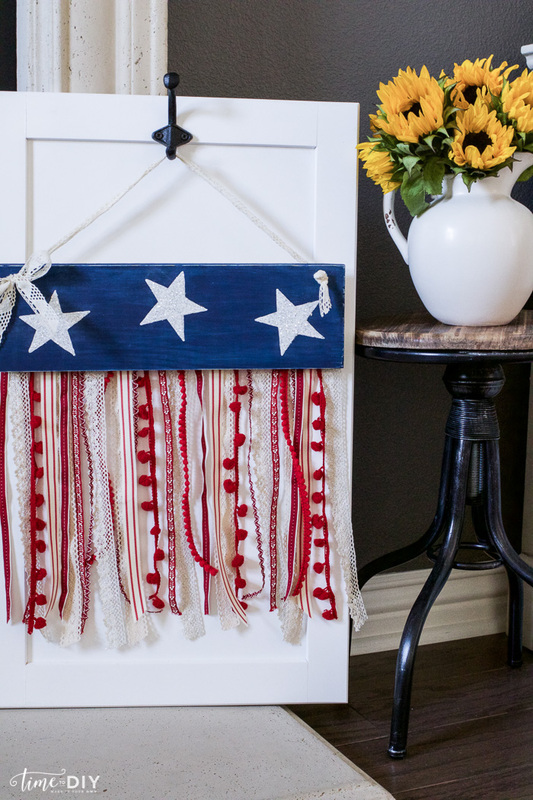 The weekend is the perfect time to spruce up your space with some fun seasonal decor or do some crafting or activities with the kiddos. So I hope you’ll pop over to the blog on Saturdays for some fun and easy seasonal ideas! 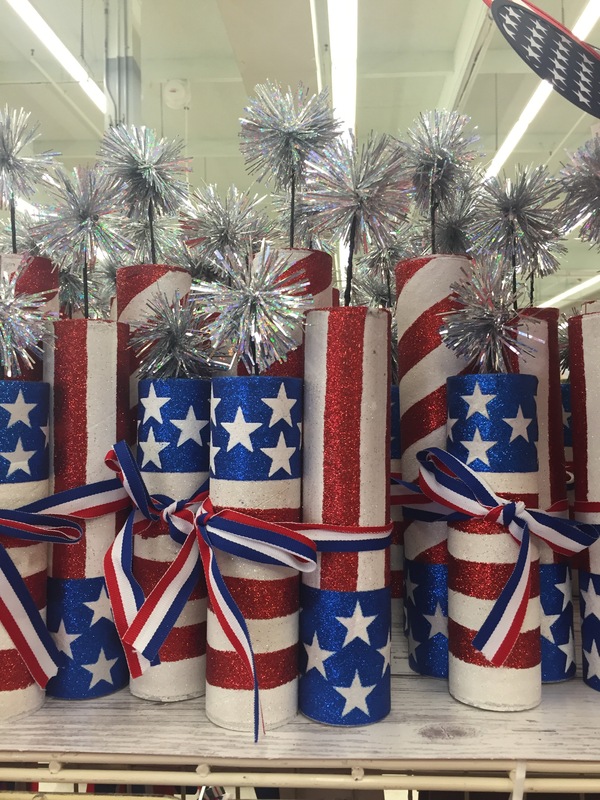 I’m always looking for centerpiece ideas so when I saw these at Michaels I thought: finally a use for all the paper towel rolls! Can we talk about about many paper towel rolls we go through on the daily? Please tell me it’s not just my family! 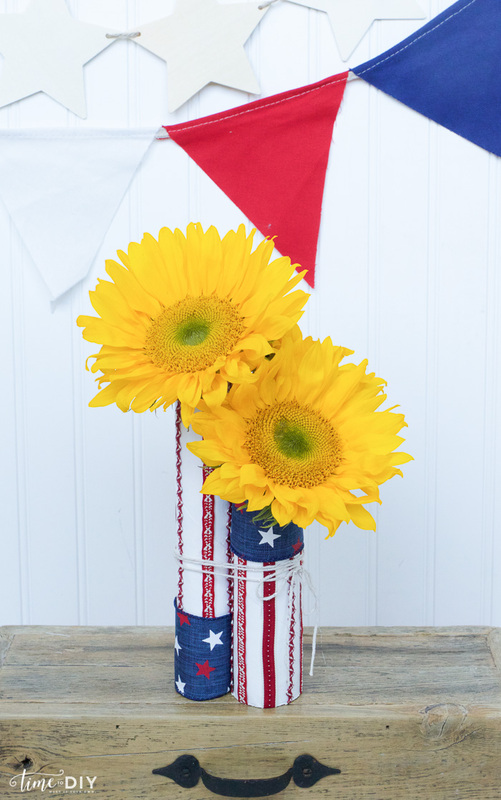 These are perfect centerpieces, but instead of the sparklers, I wanted to add flowers. 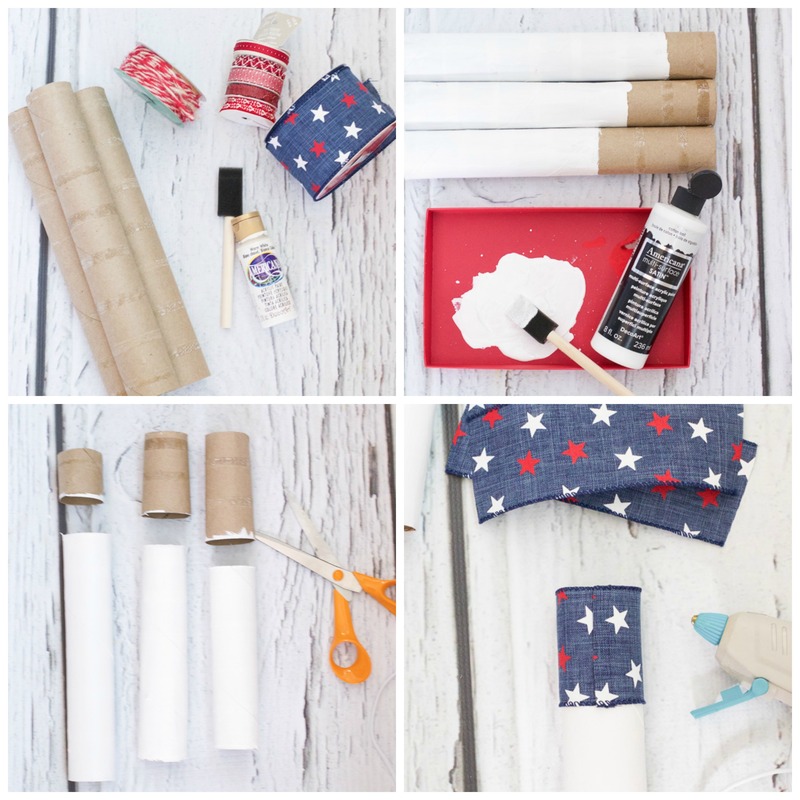 The only supplies you need are paper towel rolls, some paint and ribbon. 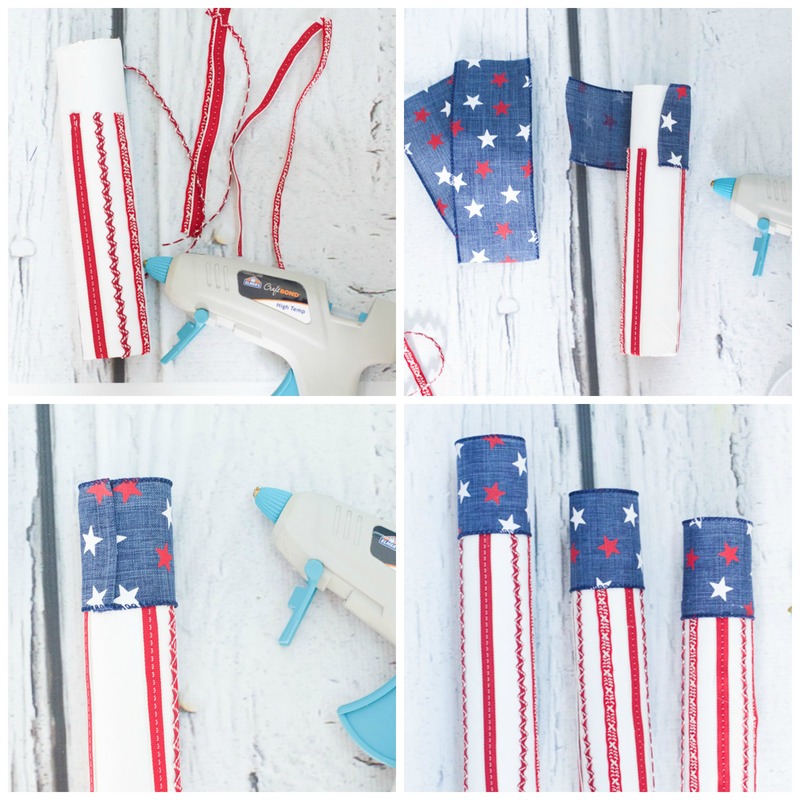 I painted the paper towel rolls white, cut them and then measured out the star ribbon to wrap around. To make the stripes, I hot glued patterned ribbon, and then finished it off with the thicker star ribbon. All the ribbon was 50 percent off at Michaels. Then I tied them together with some baker’s twine, alternating the star ribbon top and bottom. 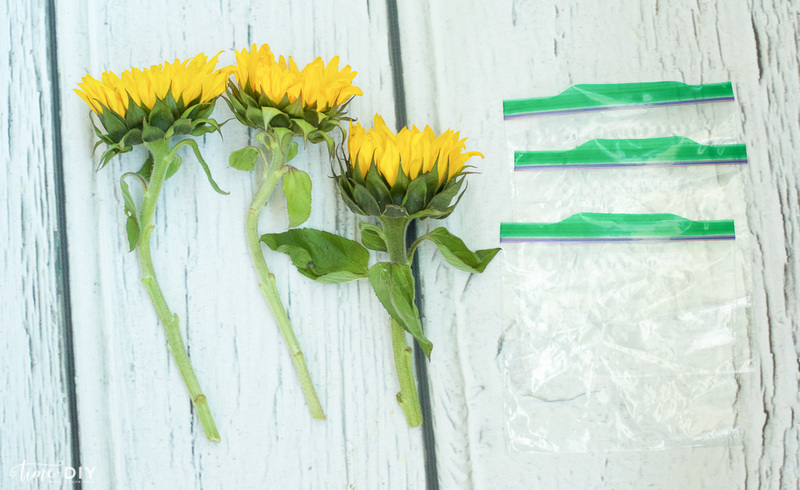 I cut the sunflowers to match the length of each roll and then filled plastic bags with a tiny bit of water (less is more! ), about 1/8 of the bag. Then I used rubber bands to secure it. The water is obviously for the flowers, but it also serves as a weight to help it not tip over. 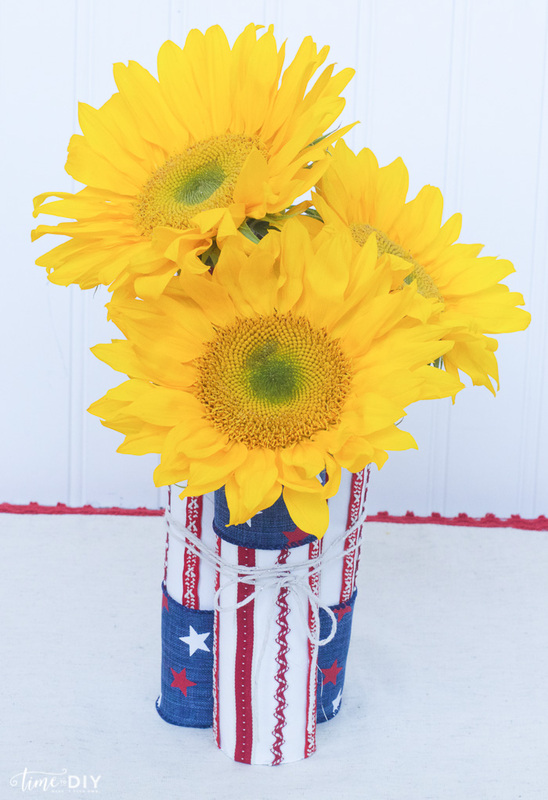 Warning: Sunflowers can be a bit heavy and tip over, but I just love them so I made it work. 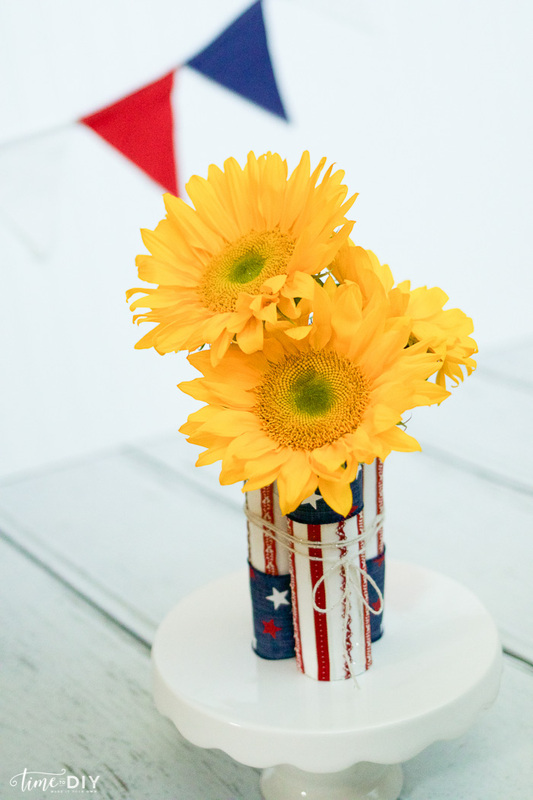 If you don’t want to deal with occasional tipping, go with lighter flowers like daisies. They look cute on a cake stand as well. Wah-la! 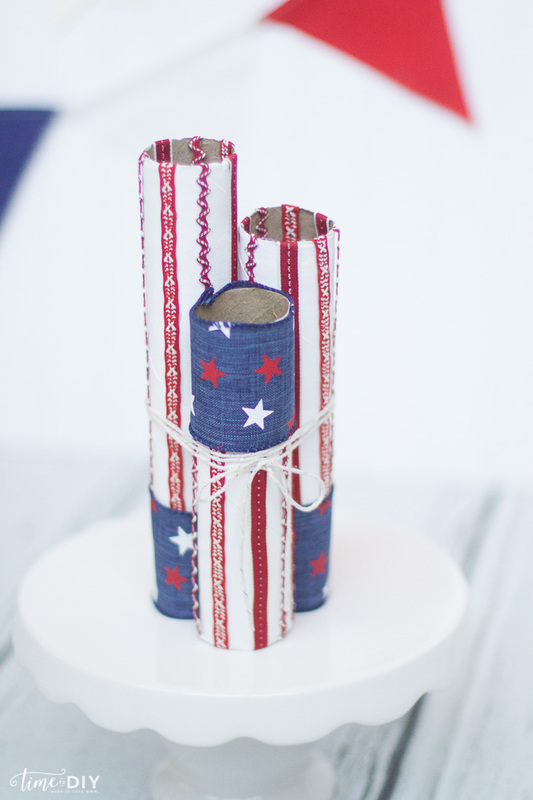 Patriotic centerpiece is done. 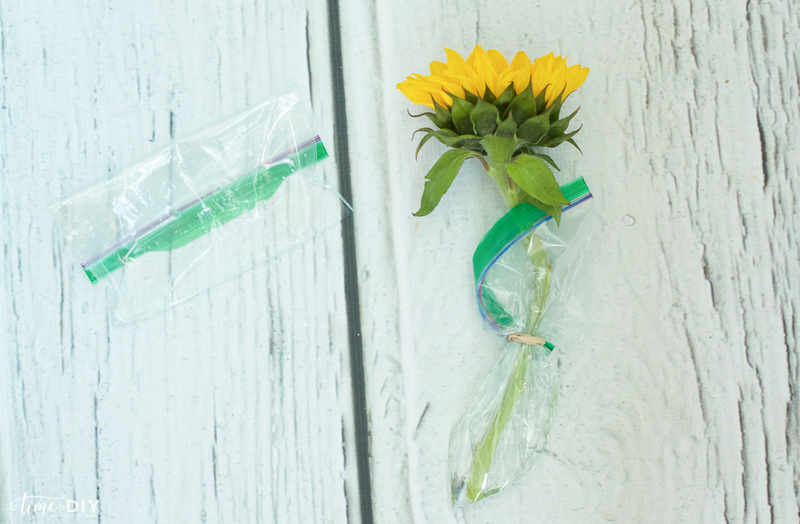 It’s also a good summer craft activity for the kiddos, or it could be a cute hostess gift. If you like this idea, pin it! 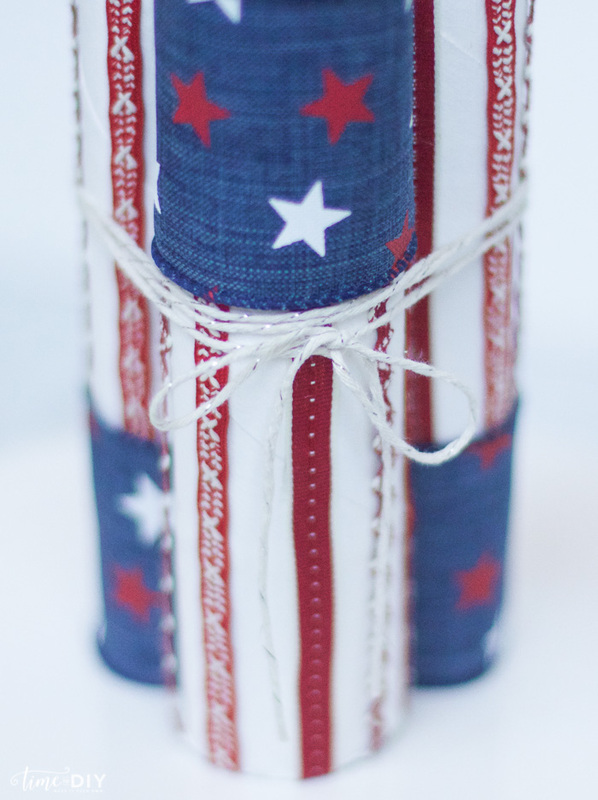 If you’re looking for other patriotic decor, check out my Patriotic Ribbon Flag.